Today is the International Day of the Girl Child 2018. On this day, the ‘girl’ power is celebrated universally in different spheres of life. The way girls are transforming the landscape of innovation, philanthropy, entrepreneurship, discovery, automation and empowerment is remarkably amazing. We at Travel Beats, an overseas Indian community portal by Indian Eagle, have selected seven Indian American girls who deserve a special mention for their notable achievements, noble deeds and noteworthy inventions. Let’s celebrate the collective power of these girls of Indian origin on the International Day of the Girl 2018. 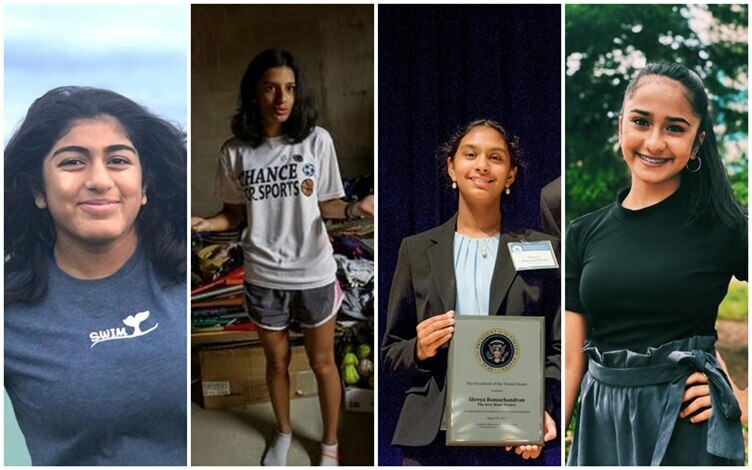 15-year-old Indian American Angel More from California deserves a mention on the International Day of the Girl Child 2018. A resident of San Carlos, Angel More is an award-winning long distance swimmer. Of late, she became the youngest swimmer to have successfully finished the California Triple Crown of marathon swimming: the Anacapa Channel (12 miles), the Catalina Channel (20 miles), and Lake Tahoe (21.3 miles). The mélange of her passion for swimming and her zest for philanthropy has resulted in the raising of funds for Children International, a Kansas City-based nonprofit that provides necessary resources for underprivileged children to learn and grow. The youngest swimmer to have covered a distance of 6 miles from the Golden Gate Bridge to the Bay Bridge, Angel More has leveraged her achievements to raise $40,000 so far. Her target is to raise $100,000 for Children International. What Indian American Anuva Shandilya from Naperville, Illinois does for underprivileged children in India is to be celebrated on the International Day of the Gild Child 2018. A teenage runner, Anuva believes that sports are transformative experiences to make one confident and fearless. A high school senior at Neuqua Valley High School in Naperville, Shandilya set up the nonprofit ‘Chance for Sports’ to provide needy children in developing countries like India with refurbished sports equipment. She finds it unfair that many children stay off the playing ground because they can’t afford to buy sports equipment due to high prices. She, along with her younger brother initiated the project by collecting used sports equipment from people in her neighborhood. Today, Chance for Sports is a 501 (c) 3 nonprofit organization with a team of 70 volunteers. Anuva Shandilya’s Chance for Sports has distributed over 3500 pieces of sports equipment, electric scooters and bicycles to more than 1000 children in India and other countries. 13-year-old Mehaa Amirthalingam is one of the five Indian American students among the 10 finalists of Discovery Education Network’s 3M Young Scientist Challenge 2018. A resident of Sugar Land in Texas, Mehaa has built an innovative water-saving toilet flushing system. The use of recycled water in the toilet flushing system not only cuts water consumption in households but also helps grapple with water scarcity. An 8th grader, Indian American Mehaa Amirthalingam wishes to be a patent-holding engineer by the time she turns 30. Among the finalists in the race for America’s ‘Top Young Scientist of 2018’ title, she believes that innovation should not degrade humanity for the sake of personal gain. 8-year-old Indian American Karina Jadhav from Southern California proved that age is no bar for making achievements. 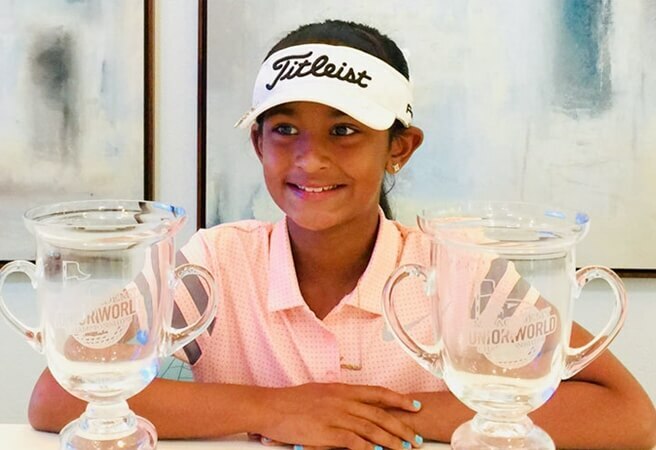 The top-ranked golfer in the United States and the 4th ranked golfer in the world in her age group, Karina finished near the top of the leaderboard in the recently held IMG Junior World Championships. A third grader at Huntington Beach Pegasus School in Orange County, she took interest in playing gold at the age of 4. Driving is what interests her a lot in the game of golf. With her current capacity to drive the ball beyond 160 yards, she finished third for driving distance in the ‘Drive Chip and Putt’ local tournament which saw her participation in the 9-year-old girls’ category. Having bagged several awards in local and regional golf tournaments, she is an emblem of extraordinary ‘girl’ power. The International Day of the Girl Child’s celebration is incomplete without a mention of 14-year-old Indian American Shreya Ramachandran, who recently received the Gloria Barron Prize 2018. The founder of the Grey Water Project, Shreya is on a mission to promote recycling of grey water – the water from household kitchens, showers and laundry – to reduce water scarcity across the world. A committed environmentalist, California-based Shreya Ramachandran works hard to educate others about safe reuse of grey water. The winner of the US President’s Environmental Youth Award, she has collaborated with several water conservation agencies to make people aware about benefits of grey water reuse. She is developing a grey water curriculum with focus on traditional and unconventional methods of water conservation for elementary students in and out of the USA. 12-year-old Indian American Naisha Bellam from Maryland is a Good Samaritan for school dropouts and underprivileged students in rural India. Trips to her father’s hometown near Hyderabad in Telangana brought to her notice the lack of quality education at tribal/government schools in the rural belt. A member of and an active volunteer at Chirag Youth Club in the US, Naisha started with the initiative ‘Caring4Kidz’, went on to set up mini libraries with quality books on various disciplines for 10,000 students of 125 rural schools in India. An award-winning girl scout in the US, Naisha is known for volunteering in humanitarian activities and philanthropic events in Montgomery County too. We’re sure the inspiring story of Naisha Bellam will initiate others into philanthropy on the International Day of the Girl Child 2018. A Congressional App Challenge winner, 16-year-old Medha Gupta from Herndon in Virginia made headlines for her ‘Safe Travel’ app. Primarily meant for girls traveling alone, the app works by sending alerts to the contacts selected by users. She brainstormed a solution for her unease of walking alone 20 minutes to her home in the dark. Her zeal for coding and technology culminated in Safe Travel app for mobile devices. Currently compatible only with iOS devices, the app helps make unaccompanied commuters feel secure throughout a desolate place and in the dark. Medha Gupta emerged a Congressional App Challenge winner in Virginia’s 10th District for her innovation. This story is part of our continued effort at Indian Eagle Travel to promote inspiring achievements and noble deeds of Indians in USA. We not only strive to issue cheap US to India air tickets but also cater inspiring stories, community news, and travel updates to Indian Americans through our free community newsletters.